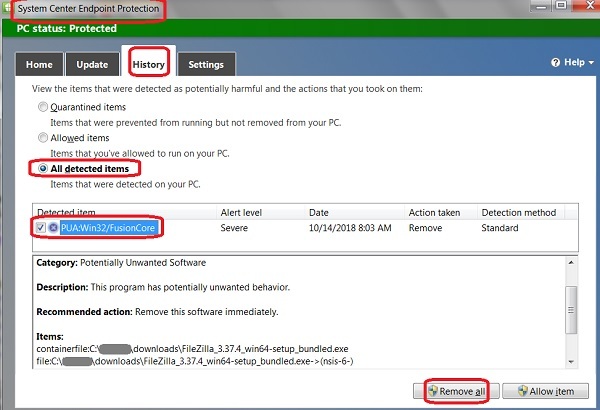 Why is my FileZilla download getting deleted by System Center Endpoint Protection? If you are running System Center Endpoint Protection as the antivirus program on your Windows system, the FileZilla client download file like FileZilla_3.37.4_win64-setup_bundled.exe will be deleted. Because it thinks that the downloaded file contains an "Unwanted Software". 1. Run "System Center Endpoint Protection". 2. Go to "History" tab. 3. Select to open "All deleted items". You a detected item called "PUA:Win32/FusionCore". Description: This program has potentially unwanted behavior. You can delete it and stop uisng FileZilla. You can allow it and trust FileZilla.